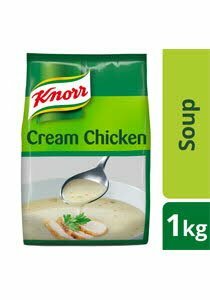 Knorr Cream of Chicken Soup is made with selected chicken meat and milk to help you deliver a great tasting, classic chicken soup which can be used as it is or as a base sauce for pies, sauces, or casseroles. Wheat flour (contains gluten), corn starch, skimmed milk powder, salt, vegetable fat, enhancer (monosodium glutamate, disodium inosynate & guanilate), chicken fat & meat (5%) (contains antioxidant BHA, propyl gallate), sugar, maltodextrine, soy sauce powder (contains soy, colorant caramel class III, enhancer disodium 5-ribonucleutides), onion powder, natural identical chicken flavour (contains egg), dried carrot, white pepper powder, turmeric, parsley. Usage instructions : 1. Dissolve 70g of Knorr Cream of Chicken in 1 litre of room temperature water. 2.Bring mixture to the boil, stirring frequently, and simmer for 10 minutes or until thickened. 3. Serve soup as it is, or as a base sauce for pies, sauces or casseroles.